Should Apple buy a carrier, or just go around them? Apple (s aapl) is famous for its “own and control” philosophy where it controls the operating system and hardware of its devices, and more recently, its heavily guarded gates to its app stores, both iOS and Mac. When it comes to the iPhone, the main element that’s still much beyond Apple’s reach is the carriers. On Monday, Jean-Louis Gassee proposed Apple solve this problem by just scooping up a carrier, like Deutsche Telekom. It’s certainly got the cash and clout to do so, but Apple has been reported for months to be working on this from a totally different angle. And more recently, the company is continuing to rack up patents on methods that could allow it to do an end-run around carriers. Apple could help users find the carrier that is best for them by ranking the features and prices of service providers based on personal preferences. For example, some users may be interested primarily in voice plans, while others may need features like unlimited text messaging. Based on a user’s needs, Apple’s system could assign a priority ranking to carriers and their respective configuration profiles, allowing users to easily find a plan and provider that are right for them. That follows a similar patent published in February. In October, Stacey Higginbotham reported here that Apple is working on a SIM card with Gemalto that would allow consumers in Europe to buy an iPhone and choose a carrier online or through the App Store without having to buy from a specific provider. If Apple pushes ahead with this offering, it will essentially sell devices at unsubsidized prices through their retail channel. This would completely sidestep the carriers. Consumers will pay full price up front and then possibly chose the service provider through Apple’s cloud services. 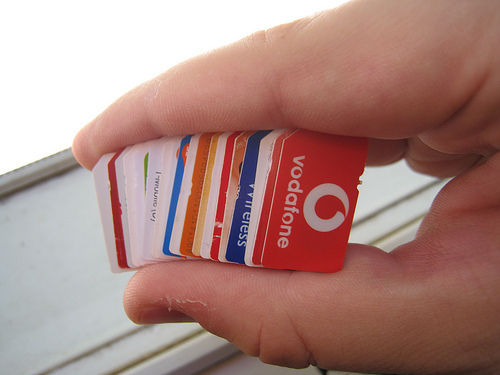 Carriers will then be forced to offer subsidies to entice users to sign on to their plans. The final hardware acquisition cost for the user may not end up being materially different with this model. This turns on its head the current sequence of buyers first choosing the carrier and then the device. In essence, it reflects the rising power of Apple. We know this is potentially great news for consumers, but there is the possibility that all of these patents filed isn’t for a consumer audience at all. Companies such as iPass, which provide wireless access to corporations, offer a similar type of service already for their members, so perhaps Apple is testing out a patent to provide another level of service for corporate customers or a new cloud service that could help subscribers optimize their phone’s connection based on the cost of the network and its quality. For example, if Enterprise A subscribes to the service, when employees see a free Wi-Fi hot spot, or a cheaper cell provider, their device might automatically elect to use that to connect as opposed to a more expensive cellular company. Plus, as consumers bring their own devices into the workplace, it’s possible that such a service could be implemented to push people over to the carrier that the enterprise already has a relationship with, when employees use their phones during work hours. This would allow people to divide their personal phone time and their work phone time more easily and still have work pay for part of the usage. It also could allow Apple to sell one model of its phone around the world, depending on the radios it crams into the handset. So maybe it would be about letting the consumer choose, and thus take out the carriers, but it might also be a way for Apple to build one version of its phone and then let the company that activates it toggle it to the appropriate setting. Of course, once the capability is on the device, it would become a popular target for folks trying to disintermediate the carriers even without Apple forcing the issue. Keep the status quo. If yuo want to do something do dual SIM. I happen to know that iPass does a lot more than what was just mentioned. It’s not just free hot spots.. User devices will automatically connect to any hot spot as long as that hotspot is part of iPass’ network.. which I believe is around 575,000 hotspots around the globe. If the writters of this article had any idea how the telco networks function, they would realize how impossible it is for Apple, or any other device maker for that matter, to ‘disintermediate’ the carriers. It will be much easier for Apple to try to buy a carrier – and I do not think that they can afford to buy any of the realy big ones – and even that strategy will be doomed as they will all the other carriers will immediately cease to carry the iPhone and Apple will only be able to sell to its own customers. The fcc mandated data roaming on all carrier networks. How else would you accomplish this ,other than a multi-sim device, since everyone’s on fifferent frequencies and coding platforms ie cdma,gsm,lte seeing as how apple owns these patents device manufacturers will either license from apple or devise there own systems to accomplish roaming. Maybe apple would offer a nice little roaming package for $5 on itunes further making carriers irrelelavent,pushing voice and all other services to data side and cloud. Apple would be a new type of virtual mobile operator for data only negaring the need for voice service or carriers simply by providing the device capable of roaming all networks. Maybe google should be allowed to buy motorola mobility simply to keep competition in the market place against apple. Apple has the money to by a major carrier? I don’t think so. Their cash and short term investments are a fraction of the value of an AT&T or Verizon. Just because they have a huge market cap doesn’t give them buying power….it just keeps others from being able to purchase them. BUBBLE stock and it will pop. Apple should just make it’s own carrier or buy one. It has the money. Apple should just buy Google and get it over with. Apple won’t buy a carrier. I guarantee it. You heard it here first. A lot of iPhone purchases are actually subsidized by the carriers. Not sure people would buy as many iPhones if they had to pony up the up-front investment.